Applied on dry, stable surfaces, free of materials that might prevent bonding e.g. dust, loose particles etc (in case of asphalt or concrete). The success in the application depends on the right preparation of the underlay and use of the material. Elastic safety wet-pour flooring ideal for children playground floorings, applied at site in various thickness from 5cm-20cm. Consists of a first base layer of recycled rubber CHUNKS, in granulometry of 20-30mm mixed with PU BINDER 1118 (SUPER SAFEPOL base layer), which follows a second layer of RECYCLED RUBBER 858 in granulometry of 1-3mm mixed PU BINDER 1118 (SAFEPOL layer). Then a third layer is applied on top, consisting of EPDM 856 granules (granulometry of 1-3mm) mixed with PU BINDER 1118, (SAFEPOL MULTICOLOR layer). The final top coating over the epdm surface is the UV-resistant polyurethane aliphatic coating POLYSPORT 1052 in two crossing layers. PLAYPREM can create many designs and patterns in a variety of colors. It is applied in 5cm-20cm thickness, even on compacted, clean, dry gravel and on cement or asphalt surfaces. Certified according EN 1177 standards by Labosport. 1. PU PRIMER 870 – Special, polyurethane primer. Apllied by brush or airless spray. 2. SUPER SAFEPOL – Mixture of recycle rubber CHUNK in granulometry of 20-30mm and PU BINDER 1118. 3. SAFEPOL - Mixture of RECYCLED RUBBER 858 in granulometry of 1-3mm and PU BINDER 1118. 4. SAFEPOL MULTICOLOR – Mixture of EPDM 856 in granulometry of 1mm- 3mm and PU BINDER 1118. 5. 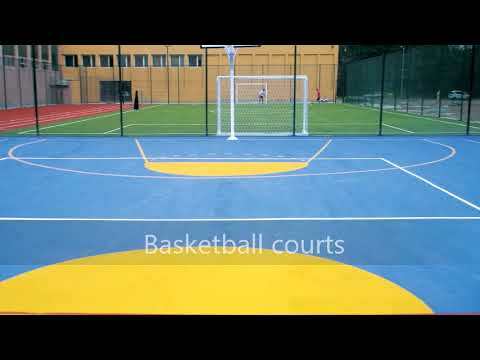 POLYSPORT 1052 - Polyurethane, aliphatic, mat or glossy, two-component top coating for outdoor sport floorings.